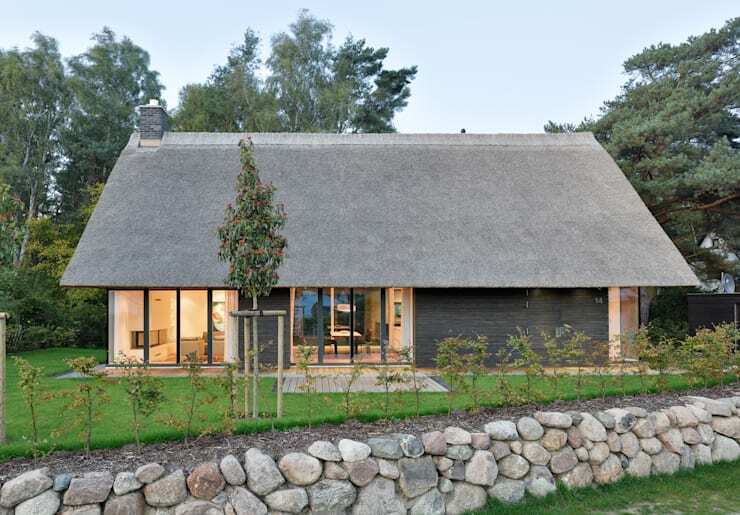 Located on the aptly named German peninsula of Fischland-Darß-Zingst, this coastal holiday home is a stylish retreat situated south of the Baltic Sea. 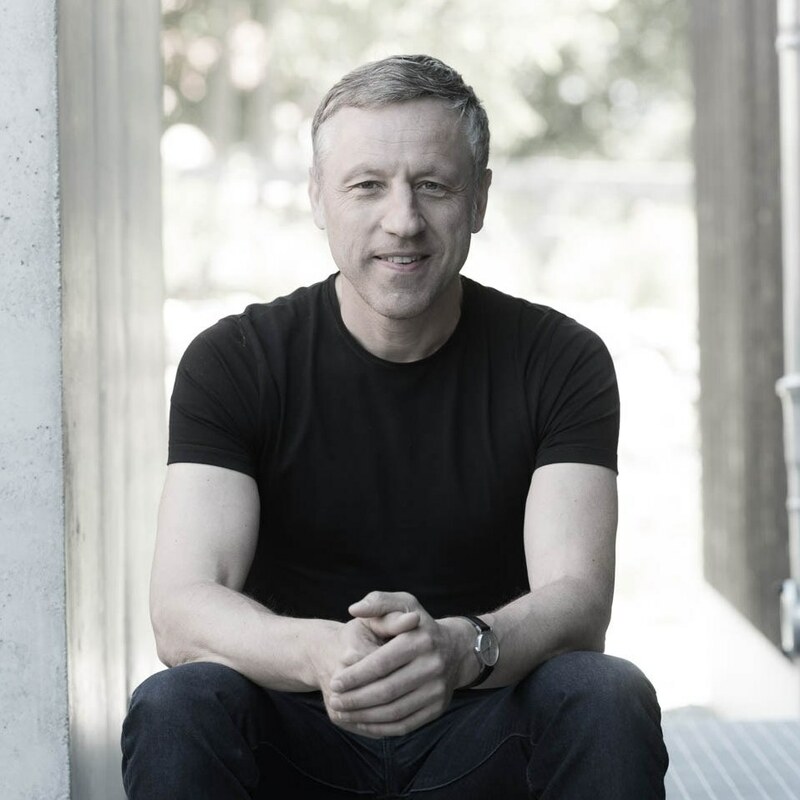 Secluded and tucked far away from the hectic pace of city life, the dwelling has been designed by the skilful team at Moehring Architekten. Boasting 117 square metres of living space, this residence offers a large open plan interior, with plenty of family friendly areas, perfect for a comfortable getaway. 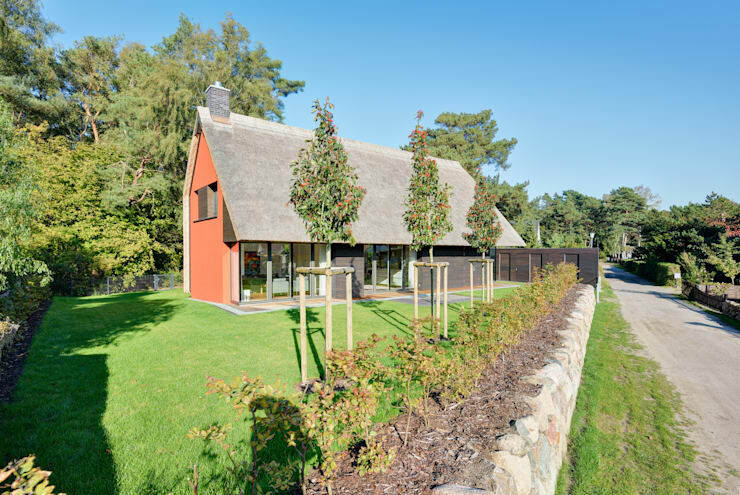 Truly a charming cottage style dwelling, this eye-catching abode includes versatile double height rooms, and a design that works in conjunction with the gorgeous surrounding landscape and environment. The home takes on a traditional form, which works well in assisting it to blend in with the picturesque village and neighbouring architecture. Inside, the ambience is light and serene, with tranquillity imparted using light hues, and neutral colours. Earthy and warm, the interior beckons the occupant by supplying a sense of comfort and creativity. If you would like to take a peek inside one of Germany's nicest and surprising seaside homes, check out the images below! As we first set our eyes upon this home, it is clear this is no normal seaside dwelling. This is, in fact, a beautiful contemporary home that has been elegantly designed and built to emulate the tradition within this small village, without compromising on style and modern necessity. From this vantage and distance we see that the home looks similar to many other neighbouring dwellings. It has the obligatory steeply gabled roof and chimney, however it also includes a large volume of glazing to the front wall. The garden is neat, tidy, and with a great expanse of lawn. Trees have been planted to provide privacy, and as these grow, they will shelter the dwelling, from both peering eyes and strong coastal breezes. Moving a little closer we can see the packed stone wall that acts as a front fence for the property, as well as a retaining wall. The best thing about this home is the way it appears at first glance to be a traditional residence, but upon closer inspection many contemporary elements and design features can be seen. 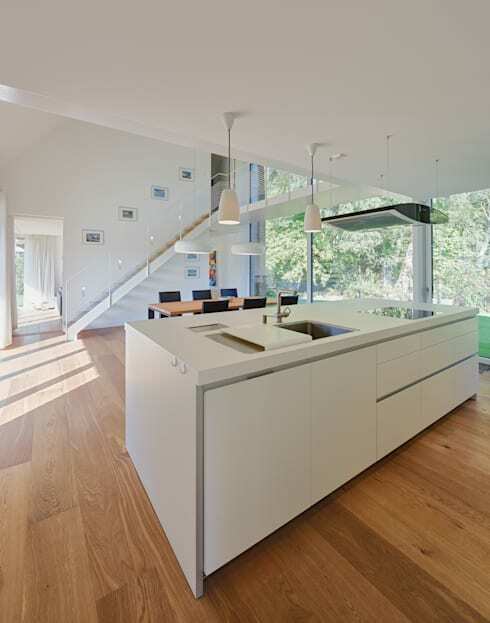 The interior appears warm and welcoming, with glazing adding to the openness of the interior spaces. Within the home we are presented with a bird's eye view of the dining space. The room is double height, and feels fresh and open. 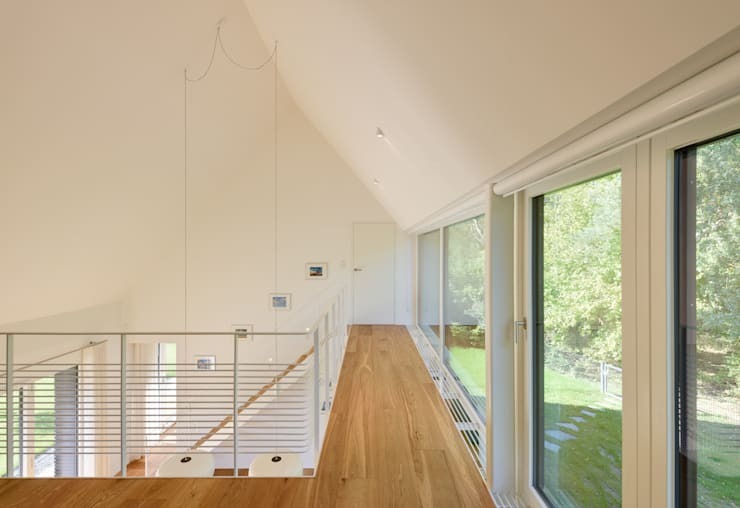 The glazed doors and windows are highly visible, and flood the room with ample natural illumination. 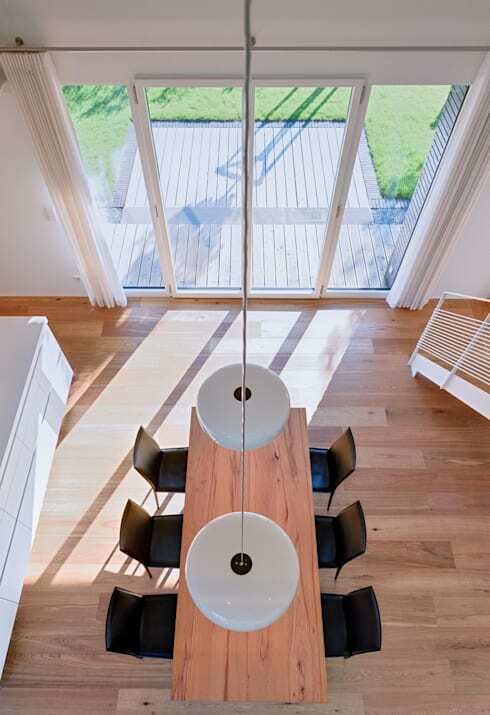 Large statement light fittings hang suspended over the timber dining table, with dark dining chairs providing that essential contrasting element. Timber is employed for the floor, and works beautifully when paired with crisp white walls, and rustic wooden furniture. The area is modern and serene, ideal for a relaxing coastal getaway. When you escape from the city and take a little time out with family or friends, it is often nice to practice a little cooking. Preparing a feast is made all the more simple with this stunning chef's kitchen. How many times have you wanted to cook a meal for your family, but resent the idea of feeling isolated within a separate kitchen room? With this open plan cooking space you needn't worry! The island contains all that one might need to prep and cook a spectacular array of treats. The appliances are top-quality, with the exhaust/extractor fan looking more like a striking accessory than a practical necessity. To keep everything looking and feeling clean, white is the predominant colour scheme. This works beautifully to reflect light that enters the room through the large glazed windows, and ensures a sense of spaciousness. Internally, the residence is a gorgeous blend of modern touches and contemporary elements. The living room, although not double height like the dining space, is still a spacious and open area. Minimalist in its approach, this lounge boasts an impressive modern fireplace with a brushed grey hearth, and a truly opulent aesthetic. The windows are dressed with thick cream drapes, effortlessly imparting luxury and lavishness. 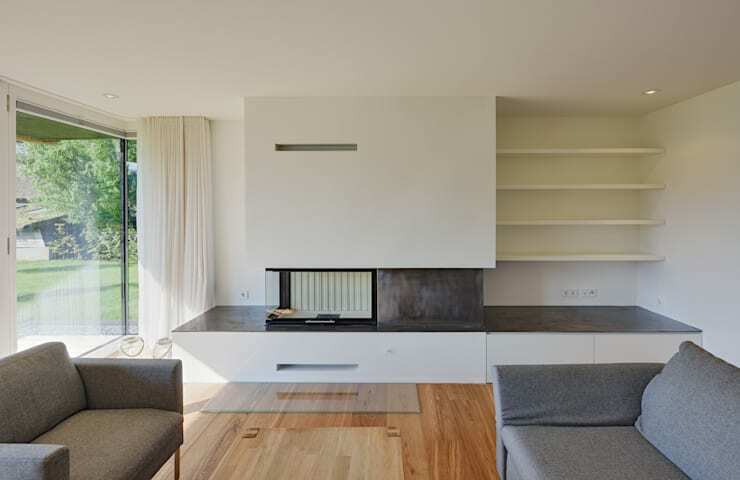 Finally, storage is included throughout the rooms, with this living space served by bookshelves and under-fireplace drawers. Moving into the bathroom we see the stylish bathroom replete with the same light, bright, white hues throughout the home. 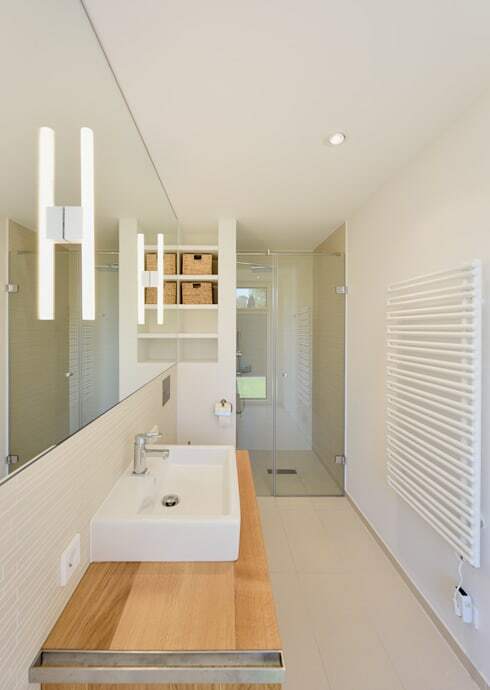 On one side of the room there is a large mirror with built-in lighting, and on the other wall a huge heated towel rail (perfect for those chilly German mornings!). This room is a perfect combination of light beachy hues, and chic neutral tones, ensuring a sense of coastal relaxation and enjoyment. Before ending our tour we thought it important to check out the upstairs hall and mezzanine. Gallery-like in its appearance, this area is fabulously illuminated thanks to the huge windows. Effortlessly liveable, this home is a standout dwelling, and a successful beachside retreat. Would you like to take a break at this gorgeous seaside dwelling? Let us know your favourite beachside getaway in the comments section below!